The Sumatra Merang Peatland project is restoring over 22,000 hectares in the Merang Biodiversity Corridor, once one of the most biodiverse regions in the country. Peatland is an ecosystem with very specific conditions and therefore is home to a wide range of endemic species. Climate finance, invested by our customers in the form of carbon credits, goes towards protecting and regenerating habitat for a huge variety of species of plants, insects and animals, supporting activities to restore the natural ecological conditions of in the project and surrounding areas. The area is highly biodiverse, and the project restores a habitat for hundreds of unique and endangered species. 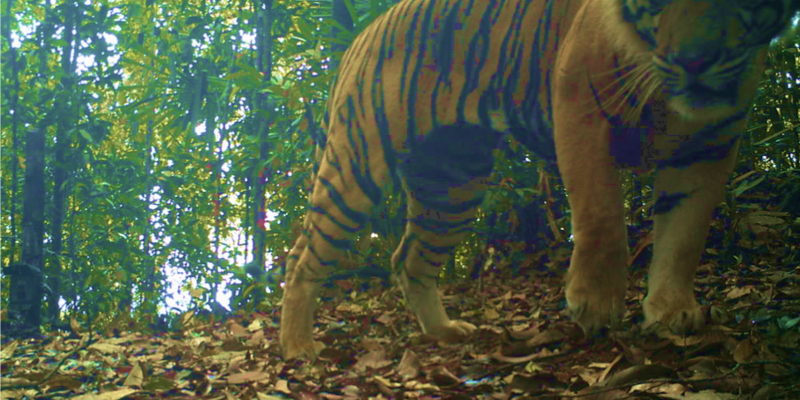 For example, the critically endangered Sumatran Tiger has recently been documented in the project concession. Only found in South Sumatra, WWF estimates that only 400 remain in the wild, and they are threatened by habitat loss caused by accelerating deforestation and poaching. The team has recently documented tiger tracks across the project indicating that the land is once again part of their range. The Sun Bear, which is listed as vulnerable on the IUCN Red List, also calls our Sumatra Merang Peatland project home. Sun bears are the smallest of the bear family, growing to only half the size of an American Black Bear. They are reclusive animals that thrive in remote habitats and therefore increasing deforestation is the biggest threat to their habitat. The project team captured footage of a Sumatran Sun Bear in the project March via drone. Click the image below to watch the drone footage. Forest patrol teams by the project have also recently reported sightings of the rhinoceros hornbill (near threatened), the massive monitor lizard, many breeds of monkey, a large variety of birds, and over 140 other unique, endemic species. Our project works to restore the rich biodiversity of the peatland forest habitat through natural regeneration, forest management, peatland restoration and mapping and drone surveys of the entire project area. This is providing new data for project teams to monitor biodiversity and further protect the concession. For example, the Sumatra Merang Peatland Project is partnering with the Zoological Society of London to perform a complete biodiversity assessment to catalogue flora and fauna across the project. The project also supports new livelihood opportunities that help reduce wildlife poaching.